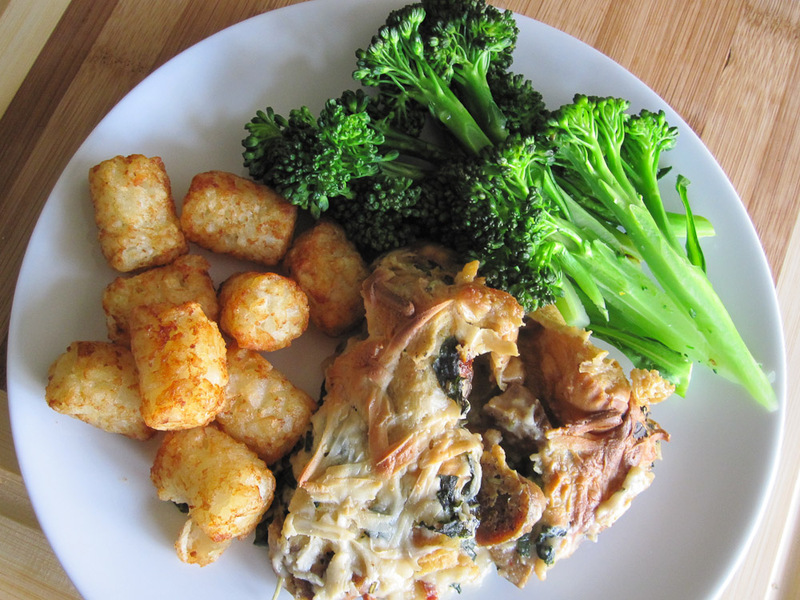 Oh yeah, this #SundaySupper is a fun one… Stuff, Wrap and Roll! So many awesome recipes to try! Things have been super busy around the house and I’m getting ready for a house guest so I went simple. Well, simple if you are a fan of frying. I’m kind of afraid of frying so this took a bit of guts but hey, if I can do it you can do it. But what is in those tasty looking rolls? Bananas and brown sugar. 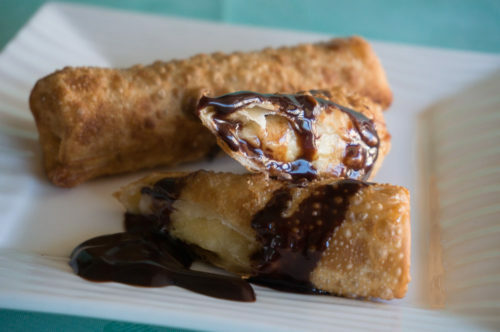 Oh yeah, these aren’t egg rolls, they are Turon, or sweet Lumpia, a Filipino dish. Such a great dessert and as you can tell it gets better with drizzled chocolate. They are so easy to put together and are perfect for a crowd. Beware though, they might drip as the brown sugar gets all melty and wonderful as the banana softens on the inside. I highly suggest eating over a plate. Begin to heat up a pan with oil on medium-low heat. Slice each banana in half, then cut each piece into quarters. Take a plate and spread the brown sugar on the plate evenly. Lay out one egg roll wrapper on a clean surface. 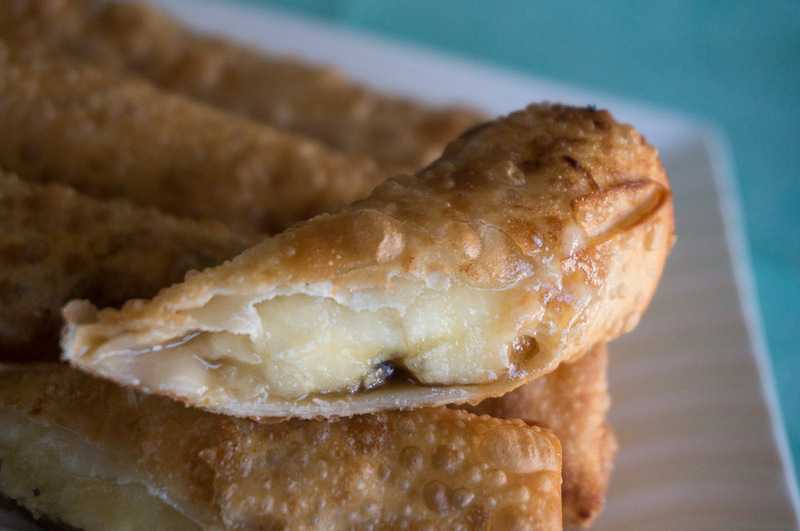 Take the slices of banana and coat them each in the brown sugar then place one slice on an egg roll wrapper near bottom edge. Roll sugared banana in wrapper once, then turn in edges and keep rolling. Seal the opposite edge with water. Oh yum! I had never heard of these, but they are going straight into my “to try asap list”! They sound delicious! And they look like something that would be difficult, but with those wrappers, I bet even I could make them. Wish I had about 3 of them for breakfast this morning. 🙂 Thanks for sharing this recipe. As a person who regularly eats cake for breakfast I can’t believe I didn’t think of that! I’m so making them for a brunch next time. And yes, they are SO easy. If you can roll a banana in brown sugar you can handle it. Plus, you can squish it when putting it in the wrapper, it’s so very easy to mold and fry up. Girl, I am so drooling right now! My gosh this looks incredible!! Holy crap! YUM!! Totally making these! What a fantastic recipe…. Love this idea and LoVe how you roll! I love anything fried with bananas! This looks so yummy & a must make for my recipe collection! Can’t wait to try it out! Oh my word. I took one look and my stomach started growling!! LITERALLY! I love to try this, it looks so delish!!! I have just drooled all over my keyboard, delicious!!! Oh Yum! And that banana makes this a total health food. I would not hesitate to get out a deep fryer if this was the result! What a yummy dessert! 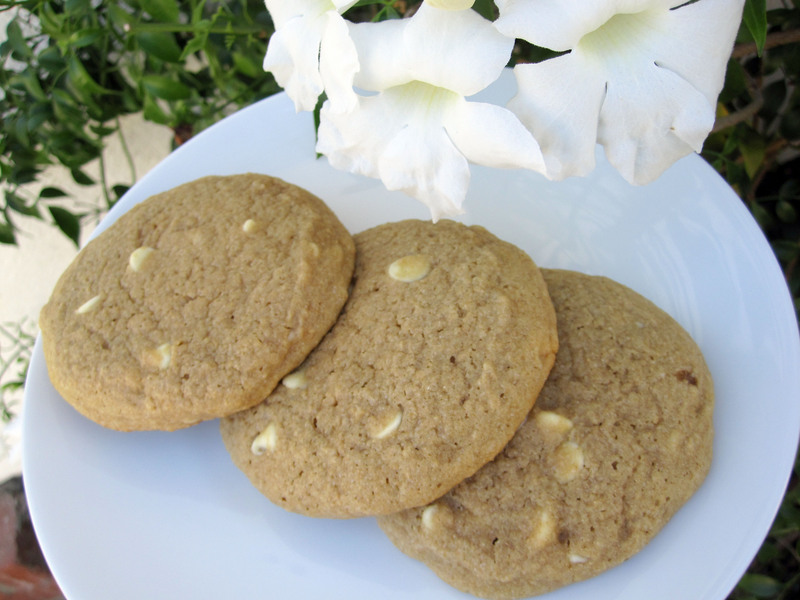 What’s not to love about these – drippy brown sugar? Yes, please! I think you need to come to my house and make these for me right now!!! Hah! Okay! They are SO easy! I can handle that! So easy and so yummy looking! Love the chocolate drizzle on top too. Yum! 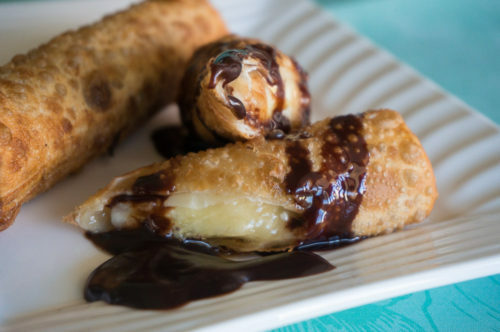 Bananas, chocolate, in a crispy crust sounds amazing. 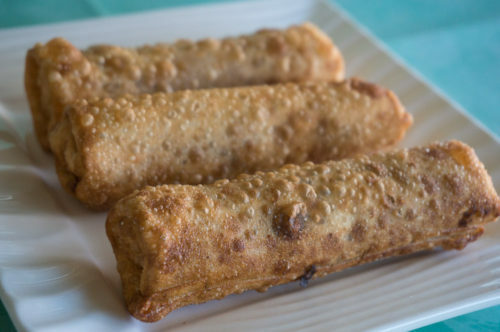 Lumpia is one of my favorite dishes but I have not tried Banana Lumpia. I HAVE to change this. Thank you for writing the instructions in such a way that this ‘newbie’ can easily understand! I’m seriously afraid of frying things but this was SO easy with tongs and a big deep pan (no chance of getting hit by stray oil bits). 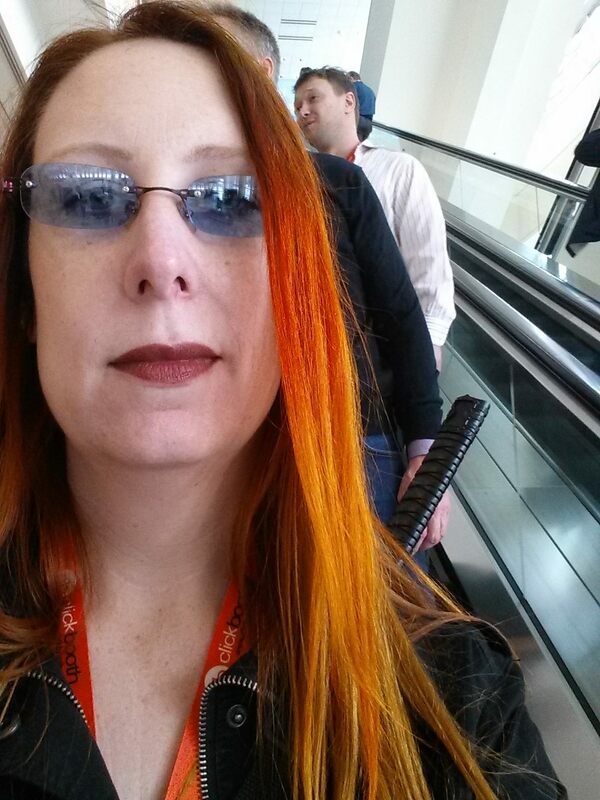 I felt like I should write it out even for myself to make again as opposed to winging it at “whatever hot degrees” so I hope it really helps you! I don’t know much either! I used to work with some awesome Filipino ladies and was always jealous of their food, but it was never vegan so I couldn’t partake. mmm bananas and brown sugar…these sound delicious! Oh my goodness we had these at a festival last year and my daughter went gaga for them. Can’t wait to make them at home. Oh WOW. I started drooling as soon as the page opened. These have GOT to happen in my kitchen soon! Shannon, I’m a huge fan of lumpia and I LOVE that you made a sweet version with bananas. I could probably eat a dozen of these in a row! You fried ’em perfectly, girl, and that chocolate glaze takes it over the top.